Our medium Talavera sun faces from Mexico make great house warming gifts or a colorful addition to your own home, garden or patio wall. 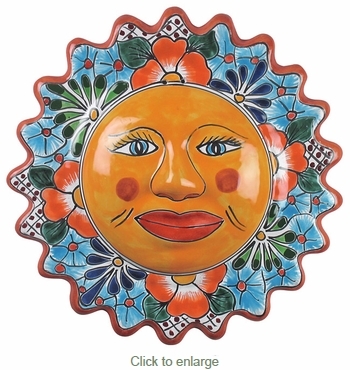 Our ceramic Mexican suns will always sport a cheerful face wherever they are displayed. All of our Talavera accessories are hand made and hand painted by Mexico's talented potters. Direct From Mexico will carefully pack your order to ensure it arrives to you safely. Traditional Assortment: The design shown is of the Traditional Talavera style. Ordered items will be chosen from our current assortment of available colors and designs. The sun face you receive will likely be different than pictured here. Talavera Pointed Ray Hanging Sun Face - 12"
Talavera Sun & Moon Wall Hanging - 14"